Guell, located in Nara city, Guell stock a full range of bicycles with including BMX and Piste (Fixed) bikes. Rider owned and staffed, Guell even have their own team of successful BMX flatland riders and the shop runs a BMX School at regular intervals in Nara, taking time to teach locals the skills of Flatland BMX riding. The shop is full of bikes, frames and parts covering all bases with everything from cool kid's bikes to practical, affordable folding bikes. Brands include Rockbikes, Bruno, Cinelli, Surly, Basso, Fuji and many others. The staff are friendly and well informed on all aspects of cycling. The store now has a very successful second branch up in Shiga prefecture too. 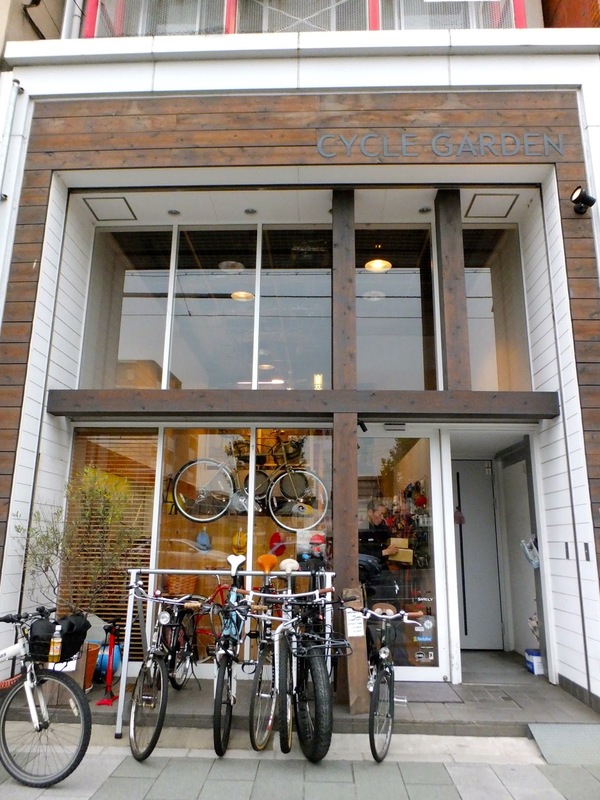 A wonderful bike shop well worth seeking it out when you visit Nara. 8to8 Cycle Life, Osaka. Re-located from their Ame-Mura store to a quieter location in Matsuyamachi, 8to8 hold a decent range of quality parts and cycles with some nice custom builds too. Read more from our March '14 visit here. Transit Bike and climbing gear store near Tomio station in Nara prefecture stocking a wide range of bikes, parts and accessories. They also do some very cool custom builds. More from our Aug '14 visit here. Kon's Cycle, Kyoto, Superb small chain of shops around Kyoto stocking a good range of custom build bikes and sought after accessories and parts. See more from our March '14 visit here. Clan Another rider owned shop, located in Shinsaibashi, Osaka, Clan is a friendly, laid back shop stocking some cool BMX bikes, parts and clothing. some gorgeous vintage BMX bikes hang from the shop ceiling too. See more photos from our May '14 visit here. Circle Geek, Osaka. Small yet very cool and well stocked all round (street, flatland, etc) BMX shop in Umeda, Osaka. Check out our July '14 visit here. EuroWorks, Seriously well stocked high end road bike shop located amongst the temples of Ikaruga, Nara prefecture. Read more from our January '14 visit here. Horie Cycle, Osaka. Small but well stocked shop specialising in cool custom town bikes, BMX and fixies. Check out our Aug '14 visit here. K&M Cycle, Osaka. Fairly new store in Sakai, south Osaka stocking a range of bikes from brands including Rockbikes and Scott. Cycle Garden, Kyoto, Big new store stocking a wide range of bikes including some very nice custom builds from the likes of Surly and Salsa. Large range of accessories and parts too. Read more from our May '14 visit here. 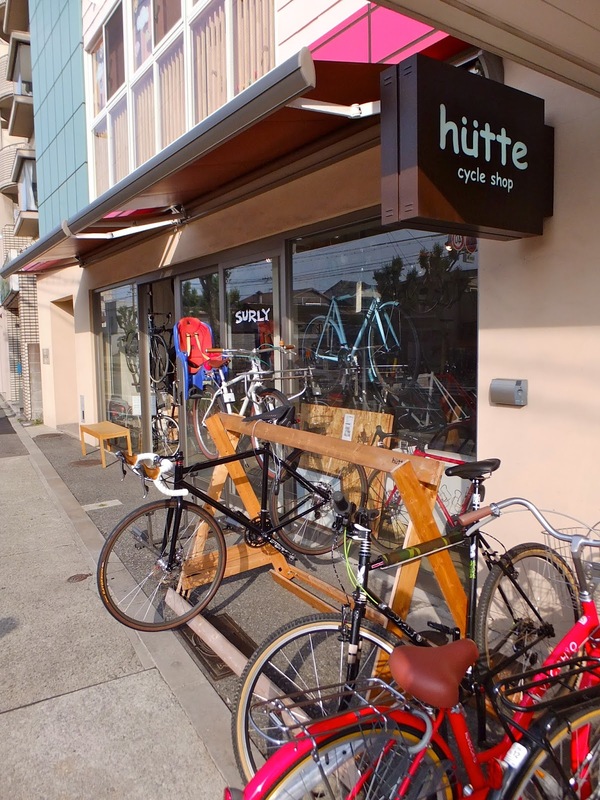 Velo Life Unpeu Now located in the popular Horie neighborhood, Velo Life Unpeu stock a nice range of city and utility bikes including some highly desirable EBS hand builds. Read more from our February '14 visit here. Cycle Shop Hiroshinomise Based in Nara city, two minutes by bike from JR Nara station, this cave like shop is chock full of goodies. The usual full range of city bikes and a special focus on MTB kit including many frames and vintage stock. Owner Mr Yao is a genius mechanic too! Many hours can be lost just browsing the huge amount of stock. Master Pista, Small and friendly shop in Umeda, Osaka. As the name suggests they specialize in Fixed Gear and Piste bikes. Some seriously cool custom builds inside. Read more from our October '13 visit here. Custom built BMX at Master Pista, Umeda, Osaka. 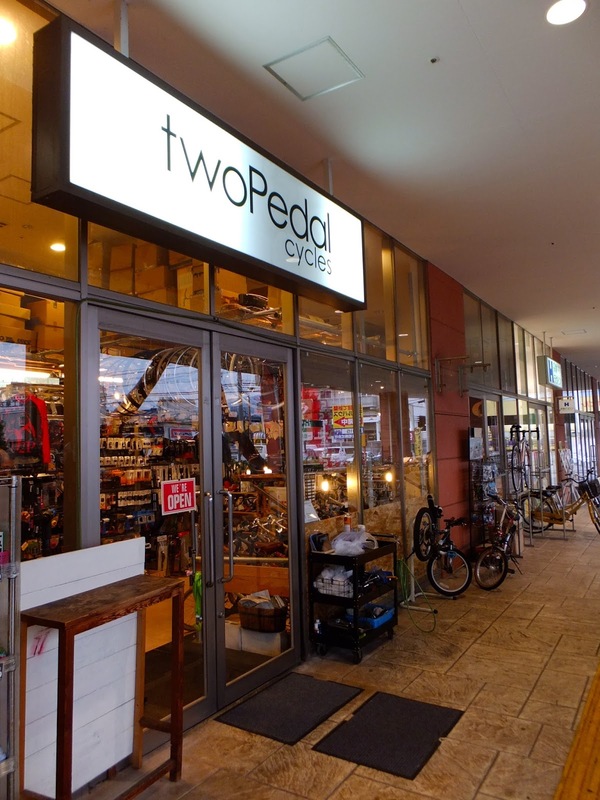 Two Pedal, Osaka. Wonderful store stocking some beautiful road and cyclocross bikes. Friendly, English speaking staff, superb range of clothing and accessories and an official Nagasawa dealer. As we said, a wonderful store. More from out Oct '14 visit here. Whoo Bicycles, Kyoto. Superb shop specialising in road and cyclocross bikes. Owner Takuya-san speaks English and is very welcoming. Also dealers of the beautiful Cherubim brand. More from our Sept '14 visit here. Brotures, Horie, Osaka. Ultra cool fixie boutique from Tokyo now with a big store in Osaka. Brotures sell a range of imported fixed gear brands including Leader Bikes and Dosnoventa. See more from our Oct '14 visit here. Kaleidocycle, Kyoto. Brilliant and friendly shop specialising is some gorgeous custom builds. Kaleido was the venue of the wonderful Handmade Bicycle Meeting in July 14 where some of the finest frame builders in Japan gathered to show off their work. See more photos from our Sept '14 shop visit here. Silbest, Kyoto + Osaka. Well stocked serious roadie shops with branches in both Osaka and Kyoto. More shots from our Sept '14 visit to the Kyoto branch here. Bici Termini, Osaka. Small but well stocked folding and mini velo specialist, great range of parts and accessories too. Check out more from our Sept '14 visit here. Hutte Cycle Shop, Fukushima, Osaka. Upmarket sister shop to 8to8 stocking some seriously desirable custom builds from brands including Surly, Ceilo, Signal Cycles and Vivalo. More info from our May '14 visit can be found here. Hutte Cycle Shop, Fukushima, Osaka. 1jyo Ultimate Factory Small chain of shops with a branch in Minami-Horie, Osaka that specialize in MTB and some very nice custom builds. Read more from our April '14 visit here. Funny Bikes, Takanohara, Nara. Friendly and well stocked road bike shop in Nara prefecture. Read more from our May '14 visit here. Vigore, Kyoto shop for the Vigore brand of bikes. Stocking the whole line of beautiful, locally made bikes from high-end racers to all round commuters. Read more from our July '13 visit here. Loro Cycle Works The Osaka store of the Loro group and the place in town for anything to do with folding bicycles. See more photos from our June '14 shop visit here. Loro World Recumbents, Kyoto based store of the Loro group and as the name says they specialize in recumbents and some folding bikes. Read more from our July '13 visit here. Function Junction. 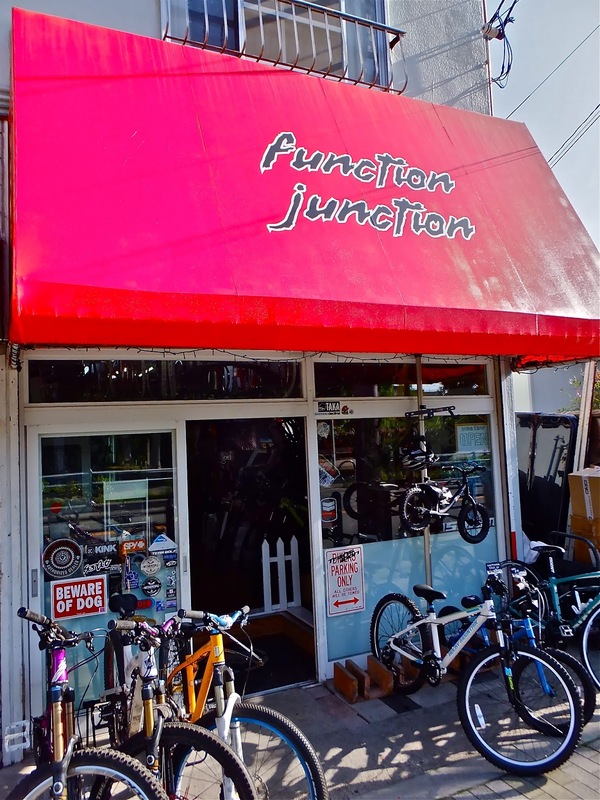 Based in the south of Osaka, Fun-Jun hosts a range of cool bikes and parts including BMX and MTB related products. Read more from our May '14 visit here. Bi-Ci-Classica, Osaka shop stocking an amazing collection of vintage road bikes and parts. Well worth a visit just to see so many beautiful, rare bikes in one shop. Read more from our July '13 visit here. 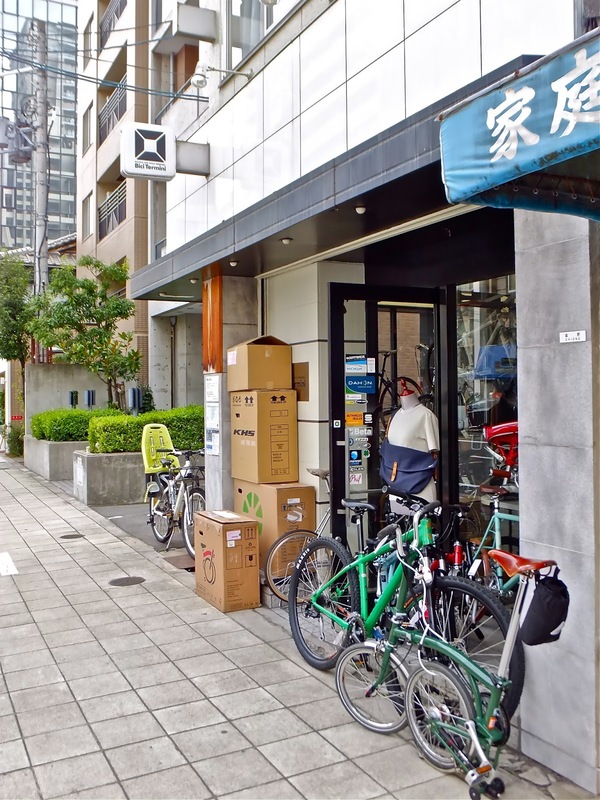 Ocean Cycle Factory, Ikoma, Nara prefecture, Ocean Cycle sell a funky range of fixed and city bikes and stock a nice range of accessories. Miyazaki Cycle, Osaka, Wonderful store specializing in classic restorations of road and fixie bikes. Many collectable bikes, parts and items inside. Owner Miyazaki-san is an ex-keirin pro racer and very friendly. Read more from our April '14 visit here and here. Infinity Based in Takasago, Hyogo prefecture, Infinity is a superb road bike shop stocking everything one would need to be ahead of the peloton! 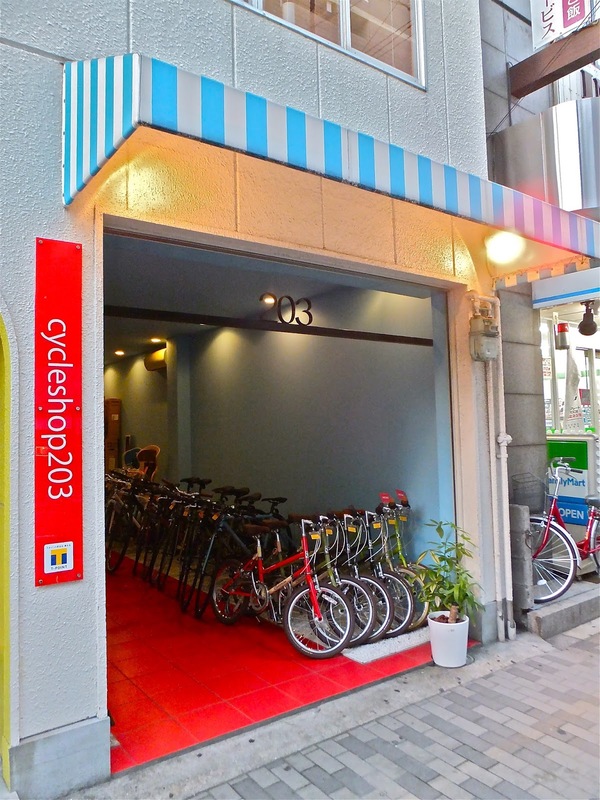 Cycle Shop 203, Osaka. Compact but well stocked and friendly shop in Nishi-Ku, Osaka, selling a good range of bikes and accessories. Bikes from brands including Fuji, Bruno, Araya, Giant and the rather nice Emperor bikes. Now with a second branch in the Horie neighborhood. Kita Cycle Koriyama, Nara. 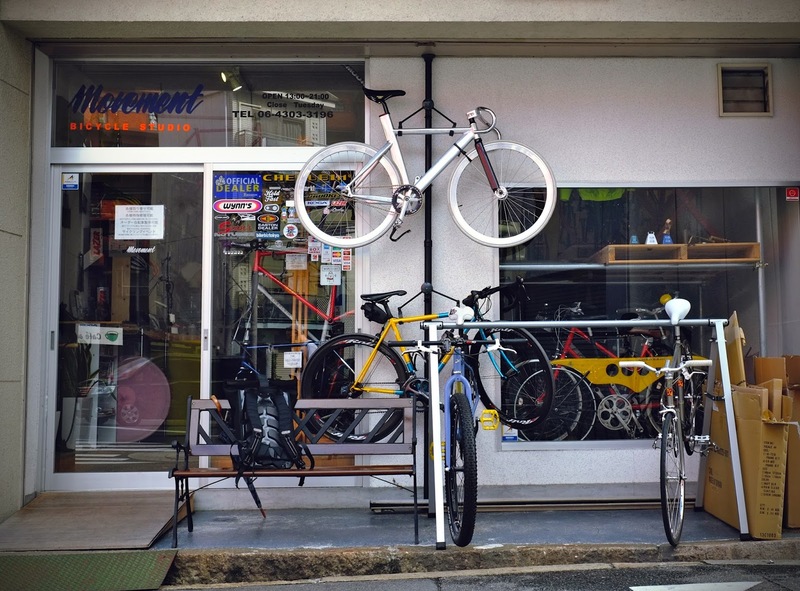 Nice, big and very well stocked road bike and all round shop located in Koriyama, Nara prefecture. Bicycle Shop Blast Another one for the Lycra and carbon brigade! Blast is an Osaka based road bike shop stocking the bikes and brands you would expect from such a shop. Tomoda Cycle, Huge store in Tenoji, Osaka stocking a wide range of bikes with an emphasis on road cycling. They also deal in some seriously collectable second hand parts and have a selection of vintage parts dating back to the 1940's. Well worth a visit. More shots from our June '14 visit here. Brew Small, Kyoto shop, part of the Wizim group, selling a decent range of fixie and street bikes and parts. 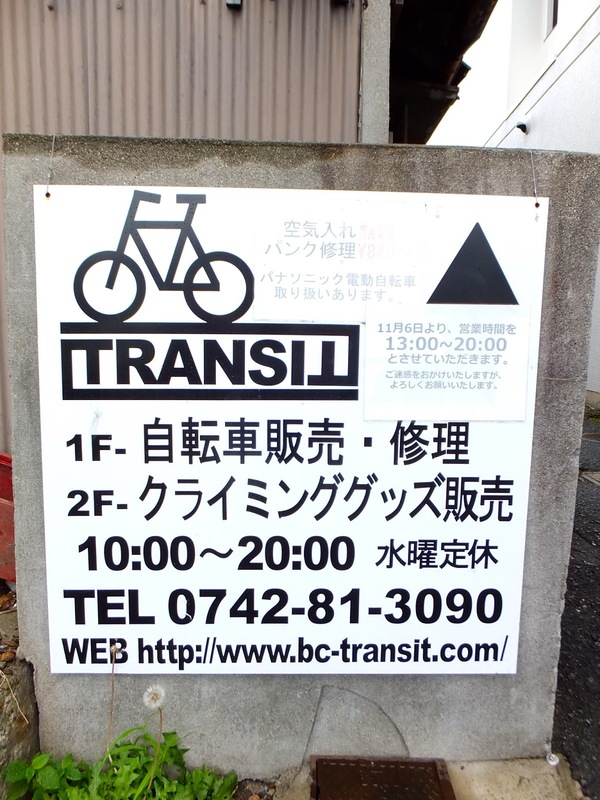 Itochu Cycle All round bike shop, covering most bases including Road, MTB, Mini-Velo and city bikes. Based in Osaka. Terao Cycle Shop Located in Hyogo prefecture, Terao sells a range of cycles including BMX, MTB and Road bikes. 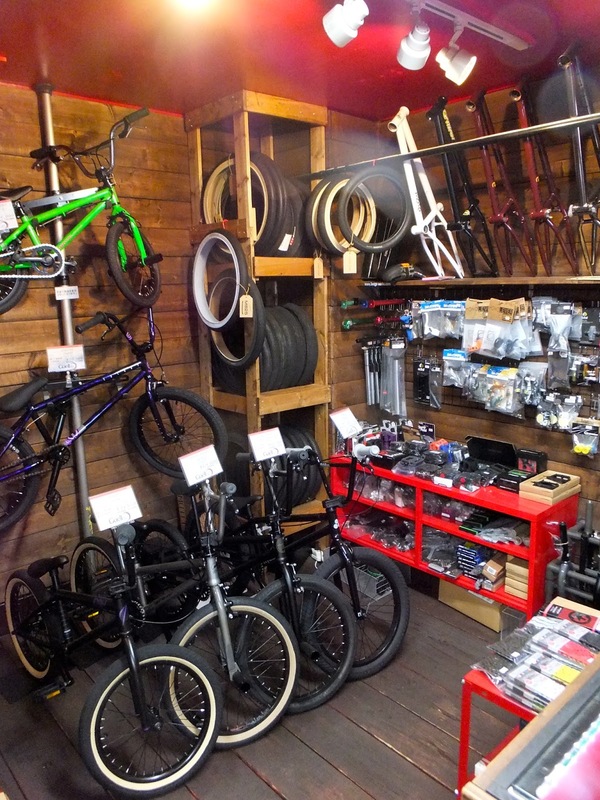 Sports Cycle Arakawa Kyoto based BMX shop stocking everything you would need for your 20 inch. Great online shop too. Read more from our August '13 visit here. Bicycle Studio Movement A wonderful shop located in Tenoji, Osaka. BSM sell a range of custom and high end bikes and a decent range of accessories and clothing, stocking such brands as Cielo, Cherubim and Fuji. They are also dealers for local frame builders Exar Proton. Read more from our September '13 visit here. Shiokaze Store Cool, Tokushima based shop that stocks a variety of fixed and city bikes. Ringoroad Serious MTB and BMX shop in Osaka stocking a huge array of bikes, frames and parts. Read more from our September '13 visit here. Rin Rin Moriguchi Classy, high end, Osaka based shop stocking a good range of bikes and parts. Many, many more photos from our June '14 visit here. Cycle Shop Eirin Chain of shops located around Kyoto stocking a wide range of bicycles and a good selection of second hand stock. Also dealers of custom order Panasonic bicycles. Read more from our August '13 visit here.